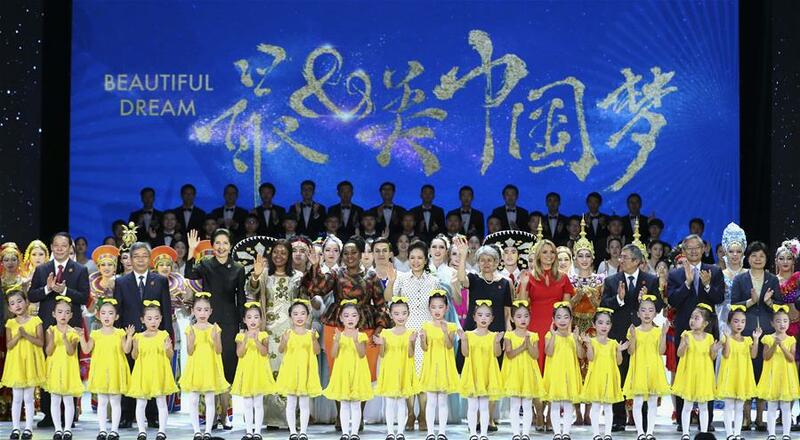 XIAMEN, Sept. 5 (Xinhua) -- Peng Liyuan, wife of Chinese President Xi Jinping, on Tuesday attended an award ceremony for the Prize for Girls' and Women's Education of the United Nations Educational, Scientific and Cultural Organization (UNESCO). The participants also included wives of delegation heads to the ninth BRICS summit and the Dialogue of Emerging Market and Developing Countries held in the southeastern Chinese city of Xiamen. At Xiamen University, Peng and UNESCO Director-General Irina Bokova awarded the prize to three representatives of the award-winning projects. The winners hailed from Thailand, Peru and South Africa. Peng, also special envoy of UNESCO for the promotion of girls' and women's education, said valuing education is a fine tradition of the Chinese nation. "We should offer help to women and children in need, and enable them to have the opportunities and capacity to change their fate and live a better life," said Peng. She hopes that the BRICS countries, other developing countries and the rest of the world will make joint efforts in promoting the development of women's and children's education. Wives of the presidents of South Africa, Guinea and Mexico, and the prime minister of Thailand, attended the ceremony.